All transactions are safe and secure with a reliable history in online purchasing behind each of our associates. Buy the I Don't Roll on Shabbas t-shirt to own Big Lebowski clothing and merchandise. Walter Sobchak (John Goodman) has one rule. "I don't roll on Shabbas," he tells The Dude. His religion, which he adopted from the beliefs of his ex wife, is the only thing that he places before bowling. 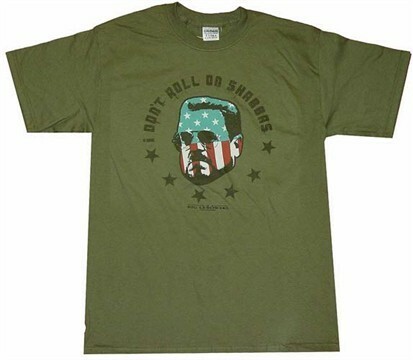 This cool I Don't Roll on Shabbas t-shirt emphasizes both Walter's patriotic side and his commitment to his religion. Wear this Big Lebowski shirt to show that you're a proud American like Walter Sobchak. In addition to the I Don't Roll on Shabbas tee above, browse the Big Lebowski Clothing Gallery for more apparel like men's and women's clothes, kids shirts or hoodies.